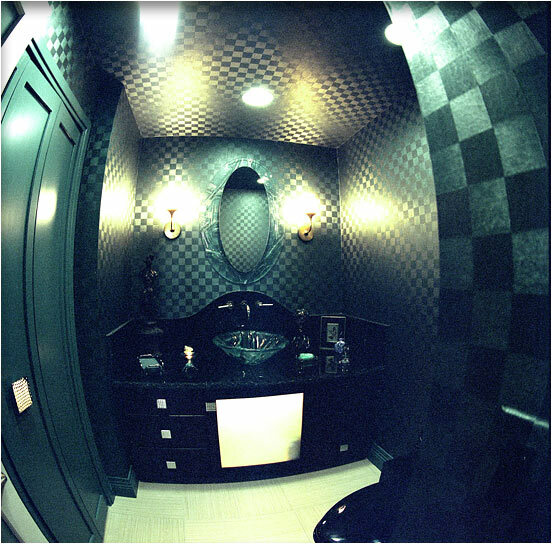 Larger Project 8-7, Powder Bathroom Remodel » Roger Perron Inc.
With this powder bathroom remodel we created an elegant and formal feel (photograph was taken with a fish-eye lens). The glass door and light behind give an unusual look, a theme carried out throughout this condominium remodel. Wallpaper was installed on the walls and ceiling. The vanity has the faucet coming from the wall with custom granite backsplash, and the edges of the granite are chiseled.